Between her design work and crystal healing, you might say Rashia Bell is the ultimate interior designer. In addition to degrees from the Fashion Institute of Technology and the New York School of Interior Design, she holds two Crystal Healing Certifications from the Crystal Academy of Advanced Healing Arts. Bell helps clients achieve balance in the truest sense, working with them to find wellness through both internal spaces and the spiritual energy derived from crystals. With an eye to the modern— she keeps black tourmaline on her phone overnight—and a passion for the essence of Earth itself, she redefines everything you thought you knew about vibes through her company, The Cristalline. Are you a (natural) morning bird or night owl? Great question! I think I am usually more of a night owl over a morning bird. Being a morning bird usually happens to me in spurts. Some days it is challenging for me to get going in the morning, since my schedule tends to change from day-to-day. Lately, it has involved a lot of back-to-back travel which definitely wrecks havoc on my routine. How my day flows from morning to night largely varies based on the intensity of my projects. Fortunately, they always energize me so it helps to balance it out. What have you been most excited about over the last year? I feel extraordinarily grateful and overwhelmed by the retreats that we led this past year. 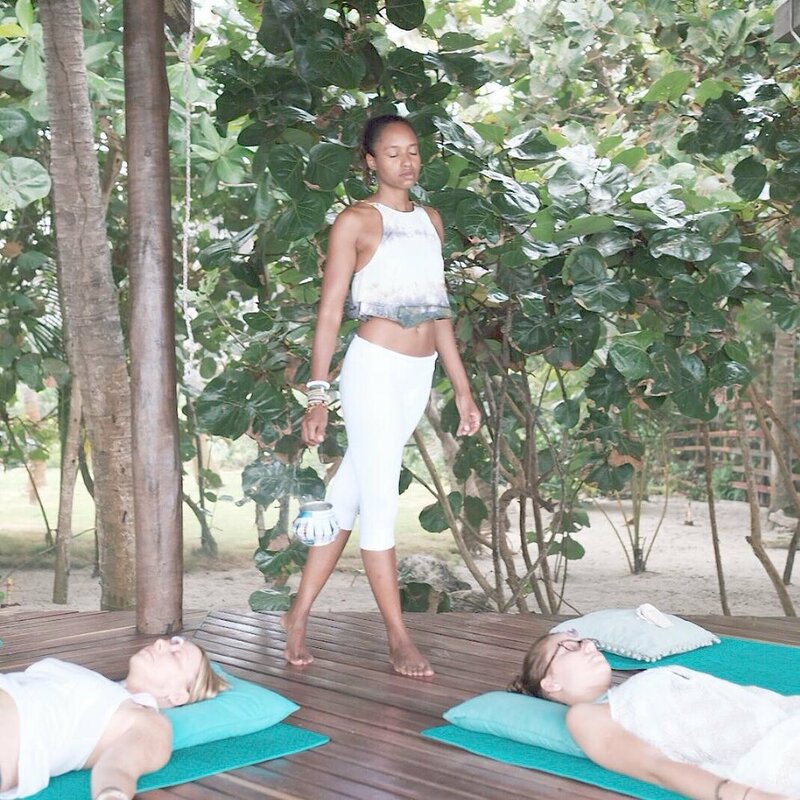 These retreats were something that I had dreamed about for some time and are now happening! My partner in the retreat, Alejandro Lázaro, and I met years ago. Our journeys were at different stages but as it happens we each informed, inspired and transformed the other’s journey as our paths continued to cross and our friendship grew. Our other partner, Juan Restrepo, was also a dear friend. So our collaborations felt like the natural next step and the first big one of many in our growing work together. I am also really excited by the success that my business partner Elizabeth Kohn and I have had with The Cristalline. The response that we have been receiving to both our Energetic Design, Private Crystal Work, and through privately selling our Curated Crystal Finds has been overwhelming. All of these things are really propelling me forward and inspiring me to go forth and challenge myself to explore new areas. What intention/quote do you live by? The Cristalline offers different lifestyle services to help people create balanced energy in their lives - one service being interior design. Can you please explain how one’s interior environment can impact one’s energy first thing in the morning, and throughout the day? Yes, Elizabeth and I are both interior designers and I am a crystal healer so we have a unique perspective on how to collaborate and assess what makes a successful energetic interior. Your living space affects the entire energy of your life including what you are trying to both move past and change. It also affects what you are trying to inspire and create. We believe that your home is both literally and figuratively the foundation for your wellness and its practice. So if your space is not in alignment with those goals, it is going to be very challenging for you to achieve them. That starts from the second you wake up, with how you choose to interact with your home. When an item of clothing doesn’t fit well or make us feel good, you change it and don’t wear it. Oftentimes people avoid regarding their home with the same scrutiny. So it is important to really think about how your space makes you feel and if it is really supporting your highest self. Having an uncluttered space with correctly proportioned items that is aesthetically consistent and pleasing, while only incorporating pieces that you truly love, are just some things that we think about to help you feel good both in and out of your home. How would you explain crystal healing to a skeptic? I would first remind them that crystals are of nature, in the same way that trees, flowers and anything that grows out of the earth, are. And we don’t question the ability for those things to be good for us. Crystals are formed by air, water, pressure and a whole host of scientific happenings that take place to create so many different types of stones. Crystals then have different energetic vibrations that are the result of how they were formed. The body is also comprised of water, oxygen and many of its own elements that create the unique genetic makeup of each and every one of us, so it is not surprising that one energetic vibration has the ability to resonate with another. And that is essentially what crystal healing is = using crystals to balance and harmonize the energy system of the body. We also use crystal stones to help balance the energy in spaces that people inhabit. I would additionally ask a skeptic if they have ever repeatedly worn a piece of jewelry with a stone that touched the skin. Who is to say that crystal healing shouldn't be regarded in the same way that we are drawn to wear one piece of jewelry over another? You sure know your crystals! How did you start getting interested in stones, crystals and crystal healing? I was always drawn to crystals as a child. I remember going into this beautiful, light-filled store that carried crystal jewelry and raw stones and I wanted to spend hours in there. I went as often as I could, each time discovering different things. One of my first jobs was in fine jewelry product development where I got to work with gemstones as a part of the design process. While I didn’t stay on that career path, jewelry and stones kept reappearing in my life in different ways. Later when I changed industries and got a 2nd degree in interior design, I was consulting in home products and worked for a jewelry designer that worked with beautiful non-traditional and sustainable stone materials. I started going to jewelry and gem shows again and began collecting crystals. As my collection began to amass, I was also starting to get into meditation but was having a tough time with it. When I decided to meditate with a crystal in my hand, it immediately allowed me to shut my brain off and settle. I started trying it with different stones to see what different sensations and feelings they created. I then started to think about crystals and the application of spaces and decided to get trained in crystal healing to learn how to incorporate them into interiors. Interior designers oftentimes act like “home therapists” so I realized that crystal work was an intuitive way to tap into exactly what the client really needed out of their space and to subsequently show clients how they could maintain harmony in their home during all stages of their life. I usually wake up after a minimum of eight hours of sleep. A benefit of launching my business is that I don’t have to start at a particular time and can plan my schedule and incorporate my wellness plan in different ways. Therefore, each morning, the first thing that always happens (as I am forced to get up turn my phone alarm off from across the room), is that all of the black tourmaline I have placed on my phone during the night generally fall to the floor! Black tourmaline has the ability to transmute electromagnetic frequencies so I always sleep with it on my phone. I also keep it on any other devices in my apartment that are constantly searching for wifi or data. The frequencies can really affect the energy in your body and disrupt your sleep. After that, I usually get back into bed. I am really conscious of putting my phone back down to take a few minutes to think about how I would like to envision my day going. The only thing I allow myself to look at on my phone before getting out of my bed are a few of my horoscopes. After that, I rise and usually have some warm lemon water or some tea. I am not a coffee person. I feel lucky to not have to rely on it to get through my day. I have never been able to eat much first thing in the morning, so this will usually hold me over until around 11 am when I am post-workout or really settling into work and/or running around. After that, I am ready for a smoothie or avocado toast or something more. 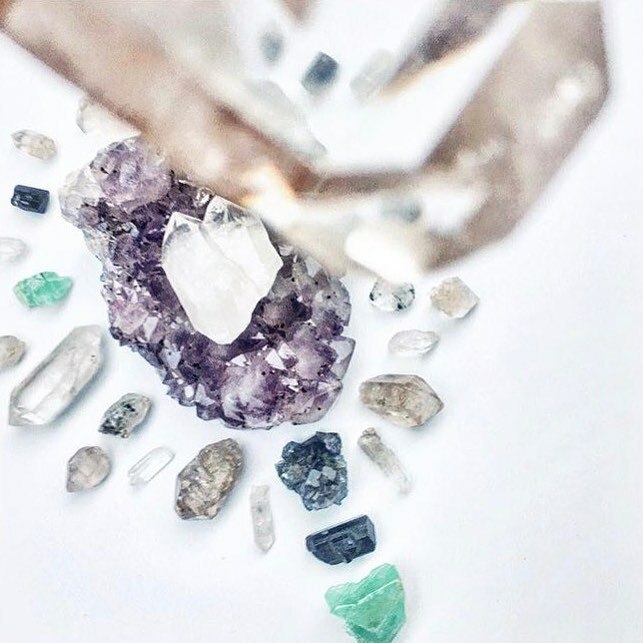 How do you incorporate crystals and crystal healing into your morning routine? What crystals do you recommend people use in the morning? Not surprisingly, I have crystals all over my apartment. However, my personal collection and the ones I usually work with, live in my bedroom. These ones tend to rotate depending on what I feel I need to be surrounded by but there are always these big rose quartz bookends on my nightstand. After I turn my alarm off and assess my energy levels and where they need to be for the day, I decide which crystals I want to meditate with. This is usually done for 15-20 minutes while seated in bed. If I am feeling tired, I may choose pyrite for energy. If I have to wear my creative hat all day, then I'll choose citrine. Generally, a stone like clear quartz is a good start for making sure your energy is clear and to set an intention, which is a great way to set the tone for the day. However, as we are all on different paths, any stone that you are currently working with should be included in your daily practice. I think you should think about the people you will be interacting with and the types of situations you may find yourself in when deciding what to practice with and carry with you. They go everywhere with me! Usually warm water with lemon, turmeric & ginger or some tea. If it is tea, usually either something with ginger or a Chai or Rooibos tea bag with a bit of almond or coconut milk. I live near Foragers in Chelsea as well as Matcha Bar, so I often stop there in the morning to pick something up. I (usually) drink tea and maybe have a little fruit for breakfast. I normally am not hungry until mid-day, when I am in full swing. How do you incorporate crystals and crystal healing into your evening routine? What crystals do you recommend people use in the evening? At night, I usually want to clear the energy that I have picked up throughout the day, from the computer that I have been in front of, the tech in my house, or energy that I have picked up from people running around in the city. Therefore, selenite is a stone I like to use in the entrance to a home. Holding in and clearing your own energy (similar to how you would sage yourself) by waving a bar or wand along the outline of the body down the arms and legs creates a nice ritual to help you transition into your living space and leave the rest of the day behind. While I have a laughably tiny bathtub, I still try to take salt baths as frequently as possible as I can. Especially when I feel drained. I like to use our Himalayan Salt Bars, some essential oil and throw in some clear quartz and whatever stones I feel like I need. It’s also a great multitasking way to clear some of your stones at the same time (making sure that they aren’t water-soluble ones like selenite, though they make for a great bath and work in the same way as the salt if the desired result is for it to dissolve!). It may sound crazy but before I got to bed I always lie for a few minutes with one of my rose quartz bookends on my chest. There is something about the weight of it that helps me ground and transition to sleep since I usually have a hard time winding down. I will sometimes also have another stone in my hand or inside my pillow and meditate for a bit which if I am lucky (once removing the huge rose one!) turns into falling asleep. There are always crystals falling on the floor in my bedroom when I forget they are in the bed! And if they break, they go in the bath. This can also be a sign that someone else in your life needs the other half, so it is nice to just leave it where someone can come across it. What do you read and listen to first thing in the morning? First thing I read is my horoscope and some inspirational words. I usually turn the news on before I leave because I am obsessed with being prepared for the weather! I keep the following on my podcast rotation: That’s So Retrograde, Modern Love from the NYTimes, The Work of Byron Katie or Raw Talk with Sheena. I've had the pleasure of being on Raw Talk with Sheena Manina, which was a wonderful experience in that I was able to share my work, crystals and crystal healing with people from all over the world! If you want to learn more about Rashia Bell and her work with crystal healing, be sure to follow her on Instagram and follow The Cristalline on Instagram and on their website. Want to read more articles like this? Check out our collection of motivating interviews.